Barwell Motorsport’s Jon Minshaw and Phil Keen have taken GT3 pole position for tomorrow’s Donington Decider. 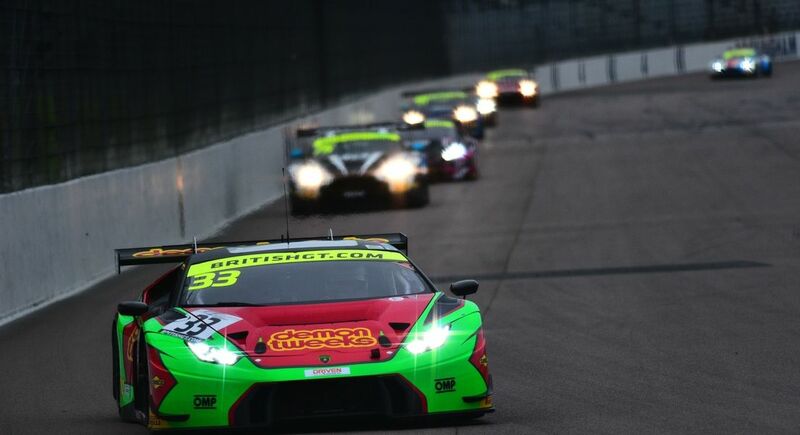 Minshaw gave the #33 Lamborghini team a two-second advantage in AM qualifying with an imperious display in improving conditions, while Keen maintained a healthy advantage in the Pro qualifying shortly after. Jonny Cocker and Sam De Haan in the other Barwell Lamborghini are second ahead of Maxime Martin and Graham Davidson in the #47 JetStream Aston Martin. 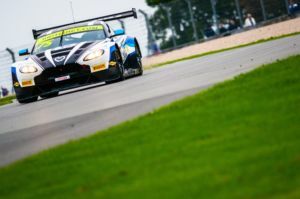 Flick Haigh and Jonny Adam in the Optimum Motorsport Aston Martin are in fourth, and need to finish seventh to secure the British GT3 title tomorrow afternoon. In truth the #33 Barwell entry rarely looked like being beaten as Minshaw put down times in the early 1:43s at the start of the session, with second in AM qualifying Graham Davidson setting a 1:43.402 by the time the session ended. The other crew in with a chance of the championship are will start the race from fifth. Mark Farmer and Nicki Thiim in the #11 TF Sport Aston also need to win tomorrow and hope that the Optimum Motorsport crew hit problems. Marco Sorensen and Derek Johnston will start from sixth in the latter’s last race in the series following his retirement announcement earlier this month, with the ERC Mercedes of Lee Mowle and Yelmer Buurman seventh. The sole GTC entry of John Seale and Marcus Clutton in the Ferrari 488 got in amongst the GT3 runners, qualifying ahead of the #101 Balfe Motorsport McLaren of Graham Johnson and Mike Robinson, the #24 Nissan of Struan Moore and Chris Buncombe and the #1 Bentley of Rick Parfitt and Ryan Ratcliffe.